Further to earlier speculation regarding the positions of Germany and Sweden, some positions of Member States have been confirmed ahead of the Council vote on 15 April. Chancellor Merkel has confirmed her support for the Directive, despite an ongoing dispute in the coalition regarding a protocol statement for article 13/17. The Chancellor also denied the reported horse-trading with France, stating that agreement was reached between countries “completely independent [of the] Gas Directive”/Nordstream 2. Nonetheless, there is a potential majority in the German Bundestag against the proposal (in response, the CDU have tweeted a proposed non-filtering implementation to Article 13/17). Swedish parliamentarians have instructed Minister of Justice Morgan Johansson to vote against the Directive, with the backing of all parties barring the Social Democrats. Nonetheless, they are not legally bound to comply with this request. The Swedish Youth League has also lobbied the Swedish government to block the Directive. Finally, a joint statement has been issued from the Netherlands, Luxembourg, Poland, Italy and Finland withdrawing their consent to the text of the Directive. The statement describes the current text as a “step back” that “does not strike the right balance between the protection of right holders and the interests of EU citizens and companies”. A later statement was released from Estonia supporting the joint position. Belgium and Slovenia reportedly intend to abstain. A minority representing at least 35% of the EU population is required for the Directive to be blocked; the current percentage stands just above 25%. 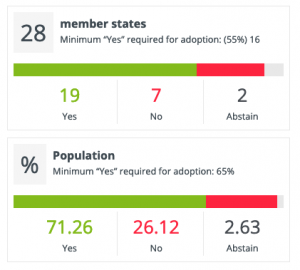 Notably, several smaller countries including the Czech Republic, Austria, and Cyprus also voted against the Directive at the plenary vote, though the support of a larger country (such as Germany) would still be necessary to block the Directive.